I have a confession. I've never made caramel. Usually I cheat and pop a splash of caramel essence into my bakes, or use Bonne Maman's confiture de caramel. However, making it myself has been at the top of my recipe list for some time. I kept putting it off in fear of swishing molten sugar around a pan and it all being a disaster. I've seen Masterchef, even the clever ones struggle sometimes. After hearing good reviews from the blogesphere of Top with Cinnamon's gif-filled salted caramel tutorial, I gave into the hype. It turns out, gifs were exactly what I needed! My first attempt worked. Although, next time I make something similar to these shortbreads, I may use less cream as Izy suggests in her notes. I just didn't dare deviate from the recipe this time round. Also, another confession. I've never made shortbread. So for this one I followed my trusty Mary Berry's Baking Bible. 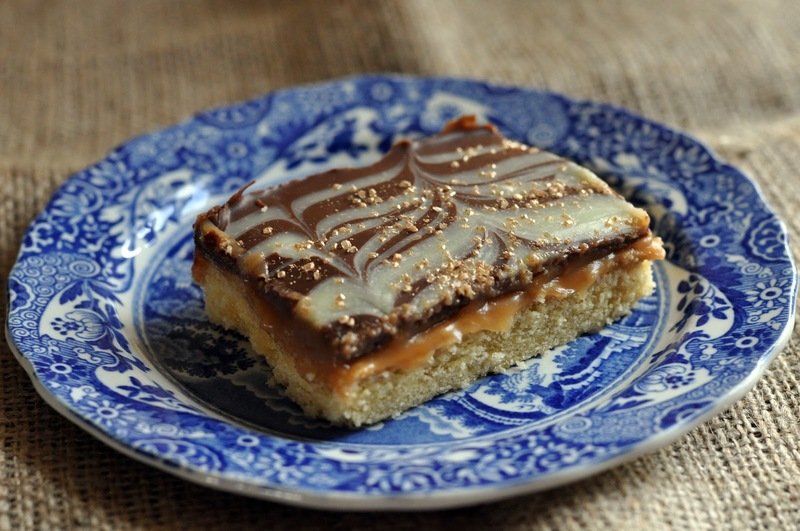 So, here it goes, millionaire's shortbread with peanut butter and salted caramel. Heat the oven to 180 degrees and lighting grease a 13 x 9 inch square tin. Mix the flour and caster together in a bowl. Rub in the butter with your fingertips until the mixture resembles fine breadcrumbs. Knead the mixture together until it forms a dough, then press it into the base of a tin. Prick the shortbread lightly with a fork and bake for 20 mins, or until firm to the touch and very lightly browned. Cool in the tin. Once the shortbread is cool, spread an even layer of peanut butter. To make the caramel, ensure that the cream and butter is measured out in advance. Put the sugar and water into a medium saucepan over a medium-high heat. Stir until the sugar has just dissolved. Once dissolved, swirl and tilt the pan around whilst the mixture boils. Do not stir! When the sugar has caramelised and is a golden yellow colour, remove from the heat. Immediately stir in the butter followed by the cream. Then stir in the vanilla and maldon salt. 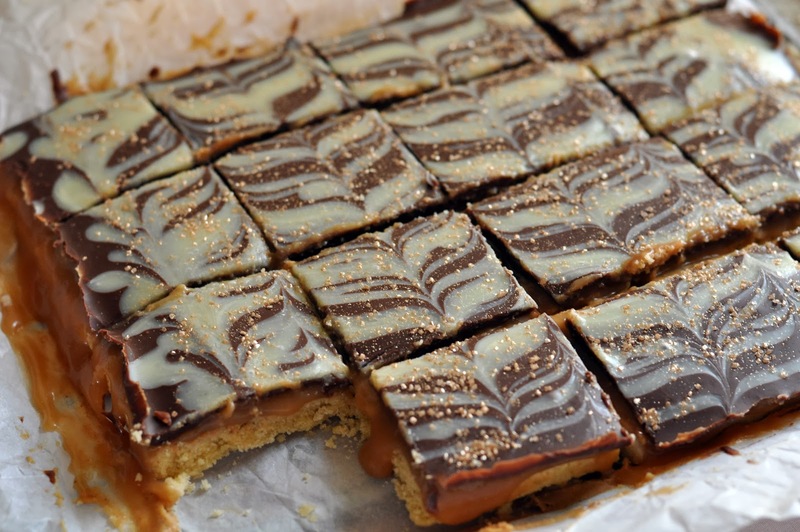 Set the caramel aside to cool slightly before pouring over the shortbread and peanut butter. Once cooled completely, pour over the milk chocolate and smooth. To decorate drizzle over white chocolate and add any other toppings of your choice. N.b. 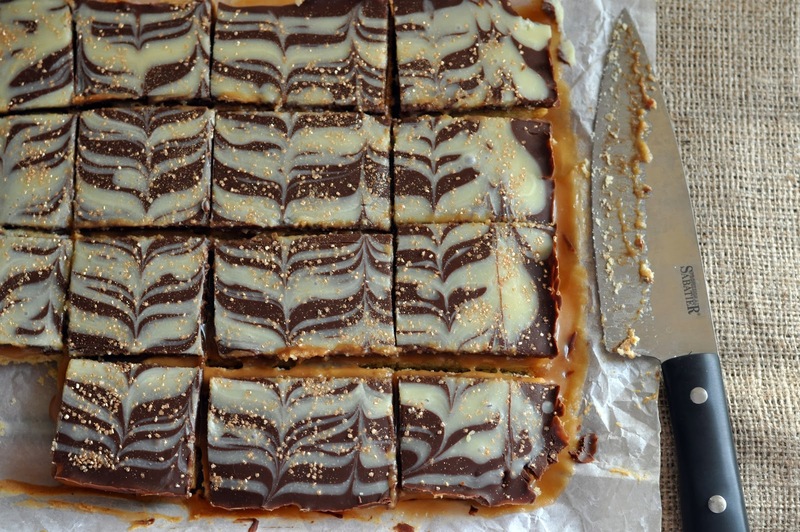 I tripled Izy's caramel mix for this recipe, these are the measurements I've included above. For her recipe and the amazing foolproof gifs, look here.